An ARV prediction consists of Remote Viewing, Analysis/Judging and FeedBack Sessions. Marty holds a B.A. and M.S. in physics from University of California at Los Angeles. He is now President of PIA (Physics Intuition Applications Corporation) and he writes the online magazine, "Connections Through Time". All future Workshops and Webinars are part of APP - Applied Precognition Project. More speakers are being added. That's why we have a Early-Bird Special until January 31. All presenters, except Dean, will be in Las Vegas. Dean is webinar only. 3. 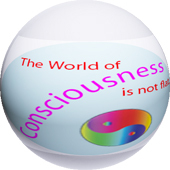 The "World of Consciousness" is Not Flat. 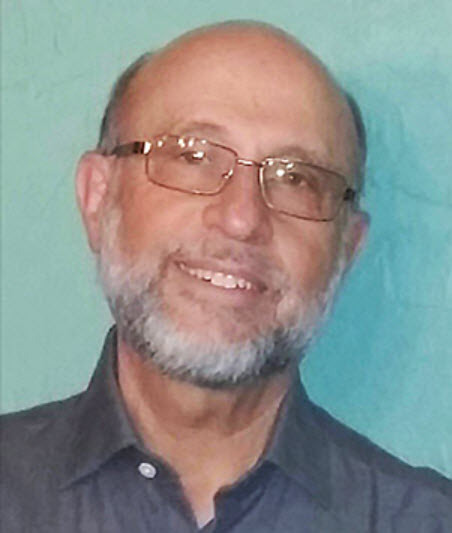 Note: Marty Rosenblatt has been the primary writer and editor of "Connections Through Time" since 1998. Initially new issues were published every 3 months, then 6 months. The last 4 issues or so have been separated by about 1 year because his focus has shifted to the Applied Precognition Project (APP) and it's Mission concerning education through practical applications of precognition, especially applications involving Health-Wealth-Wisdom. Precognition demonstrates that at least some aspects of your future moments are available to you now! Are all your conscious moments available now? 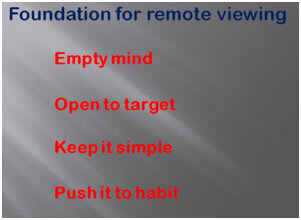 Remote Viewing (RV) is the gathering of information, operating within a pre-specified protocol, from distant targets using intuition rather than the intellect or the usual 5 senses. 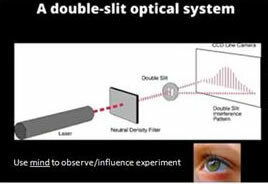 Many governments, including United States intelligence agencies and various branches of the military, investigated and applied the reality of this phenomenon for many years. Many of these studies have not been publicly released; however, enough information is public to know that this intuitive capability does exist and that it includes gathering information about targets that are distant in space and time, including the future. 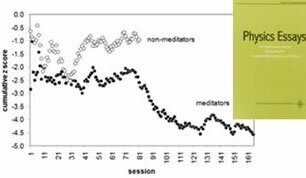 Precognition is the technical term for gathering information from the future using non-analytical, i.e., intuitive approaches. 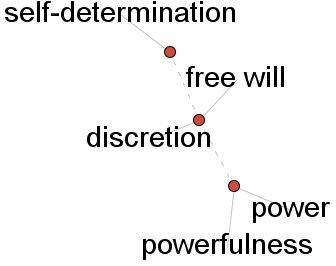 Self-precognition is gathering-sensing-sharing information from your future self! Dejavu is a familiar example to many people. Self-precognition is learning to sense and share information of interest to you between your future and your past. Einstein said, "The only reason for time is so that everything doesn't happen at once." 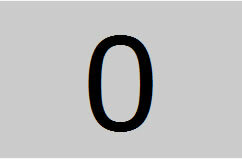 This is the idea of the "eternal now" that permits information sharing between all now-moments. 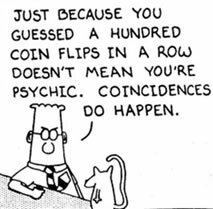 Dr. Jessica Utts, Division of Statistics, at the University of California, Davis, wrote a paper entitled, An Assessment of the Evidence for Psychic Functioning (1996). In her abstract she says, "Precognition, in which the answer is known to no one until a future time, appears to work quite well. ... There is little benefit to continuing experiments designed to offer proof, since there is little more to be offered to anyone who does not accept the current collection of data." Associative Remote Viewing (ARV) is an application for applying your consciousness to gather information from the future. Click here for a quick overview of RV and ARV. We are anxious to encourage and assist you and all those interested in exploring this fascinating and important aspect of consciousness. However, the primary "work", including enjoying the journey, must be done by you. The key elements of the model are listed in the circle below. Consciousness is taken as a given. Vibrations distinguish one thing within consciousness from another thing. I am a conscious thing. You are a conscious thing. 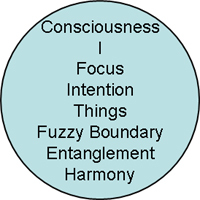 We each have the capability to Focus Consciousness using intention. I am conscious of subjective vibrating "things" (e.g., experiences, sensations, emotions, thoughts-ideas). I am conscious of you. You and I can agree on the meaning of words and measurements for many things. Our joint objective physical reality is based on these agreements. Every thing that consciousness touches (e.g., all past-present-future events) can be visualized as being in the blue circular area without a boundary - this circle without a boundary is a useful metaphor for the Universe of Collective Consciousness (UCC) (see figure at right). This Universe cannot have a boundary, since if any thing that consciousness touches was outside the boundary, that thing would have to be included as being inside. Thus, there can be no "outside" and therefore no boundary to our circle or to the UCC. The UCC contains EVERYTHING (all that is), and it is the only thing without a boundary - it is unique as the only "oneness" in this model. Any other thing (represented by the red circle) must have a "fuzzy boundary" since it can never be completely removed from the UCC. Any attempt to separate any thing from the UCC creates entanglement with some uncertainty, i.e., a fuzzy boundary. The perfect Harmony is lost and replaced with the now conscious vibrating experience. We propose that objective and subjective things follow the same laws of entanglement and uncertainty. The mathematical model-laws of quantum mechanics, general relativity and vibrating extra-dimensional strings is an extraordinarily accurate model of the objective (physical) universe. 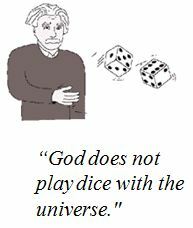 No equivalent mathematical model for the subjective aspects of the universe exists today, however the concepts embodied in the accepted physics models, such as non-locality, appear to apply equally well to subjective things. Precognition may be the best example. The connectivity between past, present and future events (events are just a series of meaningful "now conscious moments") is as non-local as any experiment of non-locality in the physical realm. We are still at the beginning of harnessing the paradigm shifting perspective of the objective universe that modern physics has supplied. We believe it is about time to broaden that perspective to include harnessing the reality of the entanglement of all subjective "nows", past present and future. 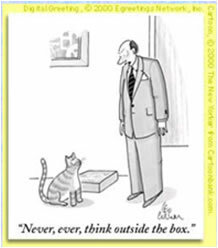 Imagine that paradigm shift! *In Quantum Mechanics, the primary model function is usually expressed with the greek letter psi, y, which is a probabilistic complex wave function that vibrates with a real part and an "imaginary" part. 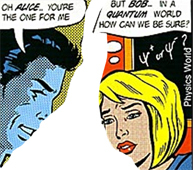 The need for an imaginary part (or an equivalent matrix formulation) hints at the need for dimensions of ideas, emotions, and other non-space/time aspects of reality. ** "Seeds of Ecstasy, 2003" is copyrighted by Jeff Mishlove. We thank Jeff for his permission to use this beautiful Yin Yang art piece.